Discover the difference a personalized hair style can make when you visit Bilalo. The team of hair design experts can do everything from women & men’s cuts, styling, wedding’s, up do’s, colour, treatment, texture and more! Indulge yourself with Bilalo’s spa services! Your one stop location for everything from nails, facials, cosmetics, waxing, eyebrow threading and more! 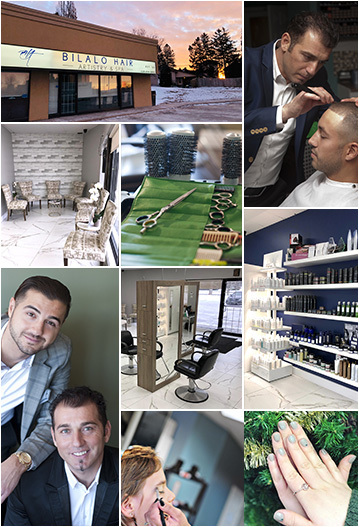 Bilalo Hair Artistry hair salon and spa is conveniently located in Kitchener just a few minutes from Fairview Mall on Weber Street by the expressway entrance. Visit Bilalo’s today to discover how a personal touch to your hair style can change your entire look! Bilalo Hair Artistry goes above and beyond any local hair salon by treating each and every customer like family, providing that personal touch only Bilalo can help you discover. Visit the best hair salon in Kitchener-Waterloo and see your new look today!